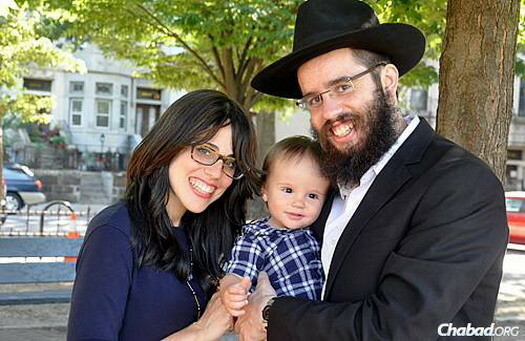 Rabbi Elie and Bracha Filler, and their 1-year-old son Mendel, recently moved to Prescott, Ariz., to start a new Chabad House. It’s a long way from New York to Arizona—nearly 2,500 miles, to be exact. 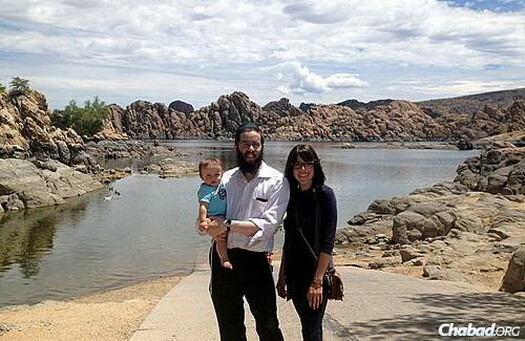 That’s where Rabbi Elie and Bracha Filler now find themselves, starting the first Chabad center in the city of Prescott and the 20th Chabad center in the state of Arizona. Known primarily as a retirement city and tourist destination, Prescott is also home to about 7,000 students from three small colleges in the area. With its mountain views and artsy downtown, it also attracts Phoenix residents, who head a couple of hours north to second homes in Prescott to escape the scorching summer heat. Unlike Phoenix and much of the U.S. Southwest, the weather in Prescott—county seat of Yavapai County, with a population that nears 40,000—is mild, with all four seasons intact. Yet while the mountainous landscape keeps the weather temperate, it also means that most homes sit in the hills as well. The Fillers’ challenge was to find one that was accessible for visitors and centrally located, which they did. 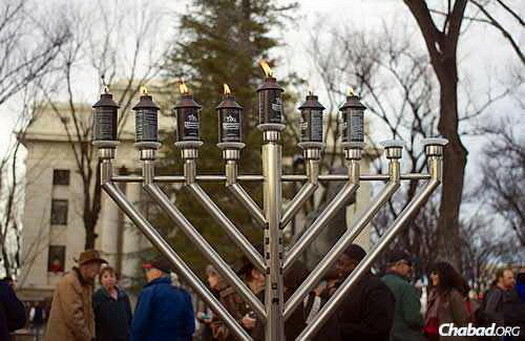 Their first major event was a public menorah-lighting at Chanukah time—the first of its kind in Prescott. The week beforehand, the couple sent out a few hundred postcards, some email, and advertised on the radio and in the local newspaper, The Daily Courier. 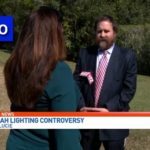 They planned to hold the lighting in the middle of town, in front of the iconic county courthouse plaza. Then they discovered they needed a permit to do so. It turns out that Prescott is known for its annual holiday lighting ceremony, which can draw as many as 8,000 people. So in December, the city doesn’t typically issue permits for other events. In the peak of the season, the rabbi called, and couldn’t get through to courthouse and county officials. His back-up plan was to hold the lighting in the local supermarket, or perhaps not at all. The supermarket initially agreed to host the event, but then turned them down. So he tried calling the courthouse again. He was able to get in touch with an assistant and explain the details of the event, and was told to call back and speak to someone else. 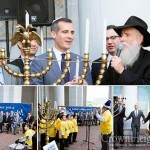 When he did, the official replied: “Rabbi, we’ve been waiting to hear from you.” They gave him the OK without a permit. “They were very helpful,” said Filler. In the end, the Chanukah event drew about 100 people, not to mention passersby who stopped to take in the goings-on. 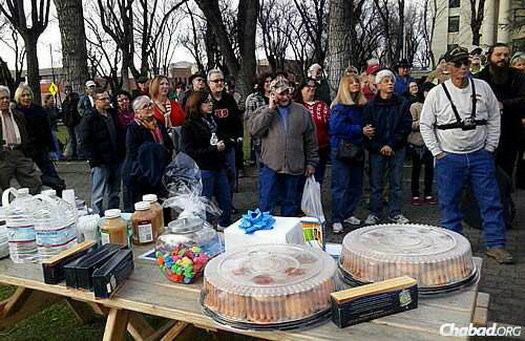 “We were so touched by the number of people who came,” he said. As her husband recited the Chanukah blessings, she marveled at how everyone seemed to join in and sing along. Already, the Fillers have adjusted to providing Jewish needs when they’re out and about. “Originally, when we came, everyone said it’s too far out,” he said—that they wouldn’t get a response from local Jewry. “But every time we are out, we meet Jewish people and wind up putting on tefillin.” Some men have ended up in tears after the experience. And they continually get phone calls asking when they will start to offer more—programming, events and Jewish content. In fact, they just held their first Shabbat dinner. For now, they are getting their meat from Phoenix or Los Angles, though Bracha Filler noted that her husband is in contact with a local dairy, and is planning on going one morning to watch them milk the cows so they can havecholov Yisroel milk. She plans to offer women’s courses and study, a women’s circle and a “Mommy & Me” class. Terry Cohen and her husband are business people who have lived in the community for 30 years. 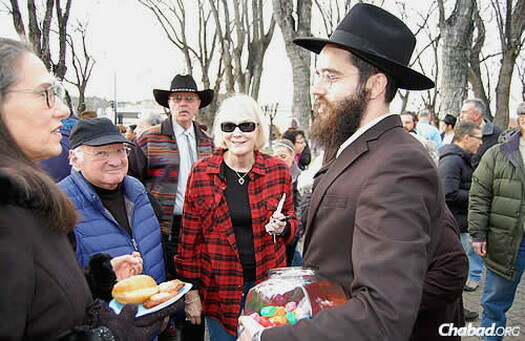 She said they would periodically get visits from rabbinical students and from Rabbi Zalman Levertov, head shaliach and co-director of Chabad Lubavitch of Arizona. When she first moved from New York, she said it was “culture shock living in the West,” but as the years go by, more and more people have come to live there. 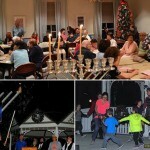 The Fillers just held their first Shabbat dinner and are working on various Jewish programming. 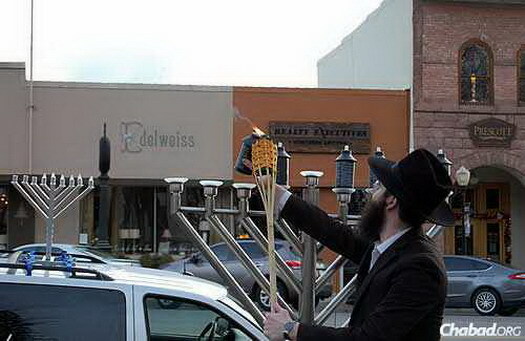 The first-ever public menorah-lighting in Prescott—and perhaps the first-ever car menorah, too. The Chanukah event drew about 100 people, not to mention passersby who stopped to take in the goings-on. B”H, I have confidence that this special couple will do amazing work Be”H!! !